Smartkarma's Premium Services (“PS”) offering serves as a marketplace for additional services such as analyst calls and bespoke research projects that flow from your written research on the platform. Premium Services allow you to monetise your engagement, on a more in-depth basis, with Clients. We believe that when it comes to the provision of Premium Services, the key unit being transacted is your time and expertise. 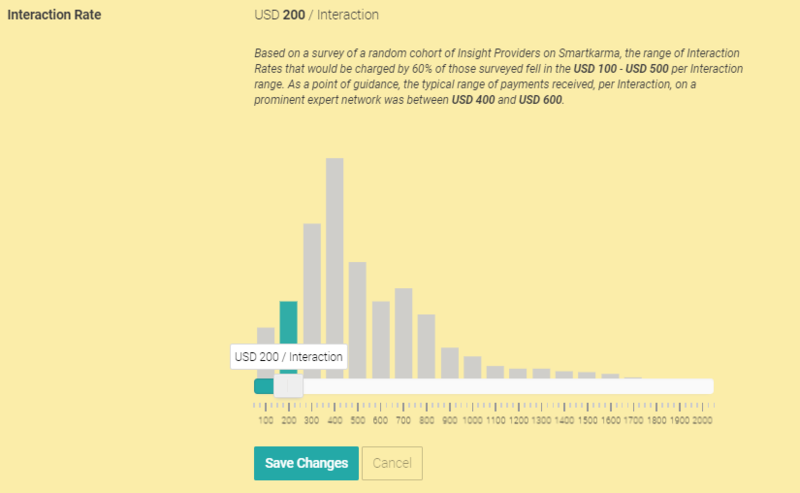 We ask you to set an Interaction Rate, which is a standard rate in USD that you expect to be paid per Interaction with a Client. When you set your Interaction Rate, you should consider an Interaction to be an everyday event such as a phone consultation. You will quote more complex services such as financial models and bespoke research services as a number of standard Interactions that you believe fairly represents the effort and expertise you expect to put into the service. As an Insight Provider, you can choose to enable yourself to provide Premium Services by accessing the Premium Services tab (diamond icon) on the left sidebar of your screen. Select the Premium Service types you would like to offer, and set your Interaction Rate, in USD. Review and Accept the Insight Provider Premium Services Terms. If your Company has a Compliance Officer, you would need to ask her/him to enable Premium Services. To see how to do this, click here. Your Interaction Rate is not set in stone and can be changed. To do so, after enabling Premium Services, hover over the Interaction Rate and click Edit. You can use the slider to adjust your Interaction Rate, from USD 50 per Interaction to a maximum of USD 2,000 per Interaction. If your Company has a Compliance Officer, you would need to ask her/him to make these changes. To see how, click here.